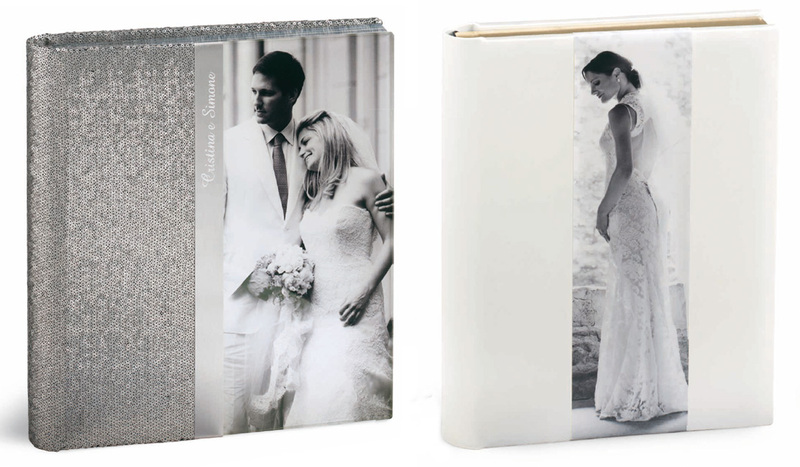 We offer several stylish and modern hand-bound wedding albums, all made In Italy, designed in-house tailored to your need, with different options for family, friends and mini albums. We desire to offer to our customers the best. Our wedding albums they have continuous page heat binding without any vinyl glues which guarantee strength and durability, available in various formats and different sizes. Printed on either matte or metallic photographic paper, each album also comes with a satin ribbon bookmark, with more than two hundred kind of covers. We offer also engraved metal band, steel and Swarosky initials, gold and silver page edgings. We design each album in-house and we love a minimalistic style mostly on white background, but we are open to satisfy your needs. Here you can see a sample of layout from Maria Pia and Roberto’s album shot in Rome, Italy.